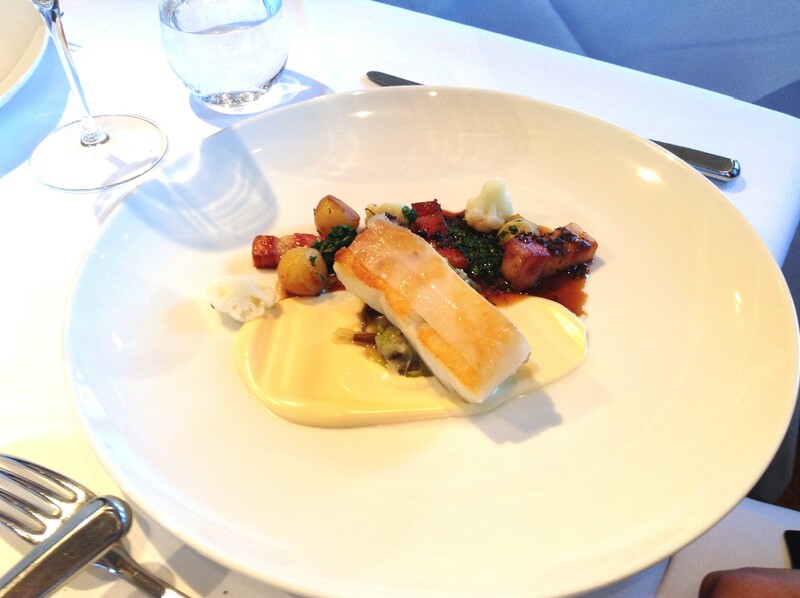 On Saturday we celebrated a friend’s birthday at Michelin-starred The Glasshouse in Kew. Kew is a quaint town in West London, home to the famous Kew Gardens. In a central area almost like a cul-de-sac, there were a number of independent shops, a lovely looking pub and The Glasshouse. Large windows on two sides draw your eye from the street, but besides these there are few distinguishing characteristics. Once inside, the minimalism continues with only a few pieces of art on the walls, white linen and modern furniture which help quell the stuffy feeling some Michelin-starred restaurants can have. 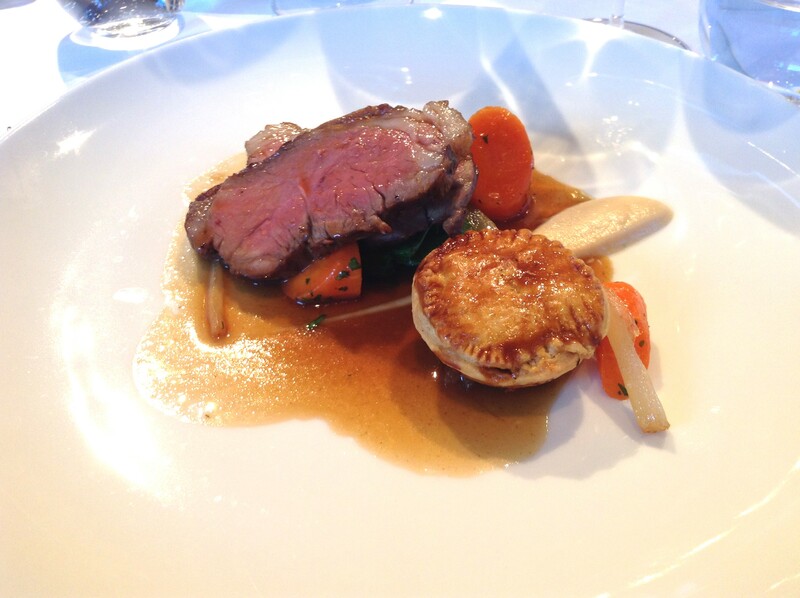 The staff greeted us warmly and offered the usual Michelin-star service throughout the meal being visible just enough, but not interfering with our conversation or our enjoyment of the food. All of the food was exceptional and beautifully presented, and they got extra brownie points for having a Kentish wine on the menu in the form of Biddenden Ortega 2012, which we ordered. Around the table we had starters of bouillabaisse of gurnard with saffron potatoes, squid, mussels and rouille, hare tagliatelle with prosciutto, portobello mushrooms and grilled spring onions, leek and potato soup with truffle and warm gougère and warm winter salad of smoked eel, salt baked beetroot, apple, salsify and cod beignet (pictured). For mains, we went half and half with two of us ordering the roast lamb with tongue, lyonnaise onions, salsify puree, lamb pie and rosemary jus (above) and two of us ordering the Cornish cod with cauliflower purée, chanterelles, pomme parisienne, lardo di colonnata and truffles jus (pictured at head of post). 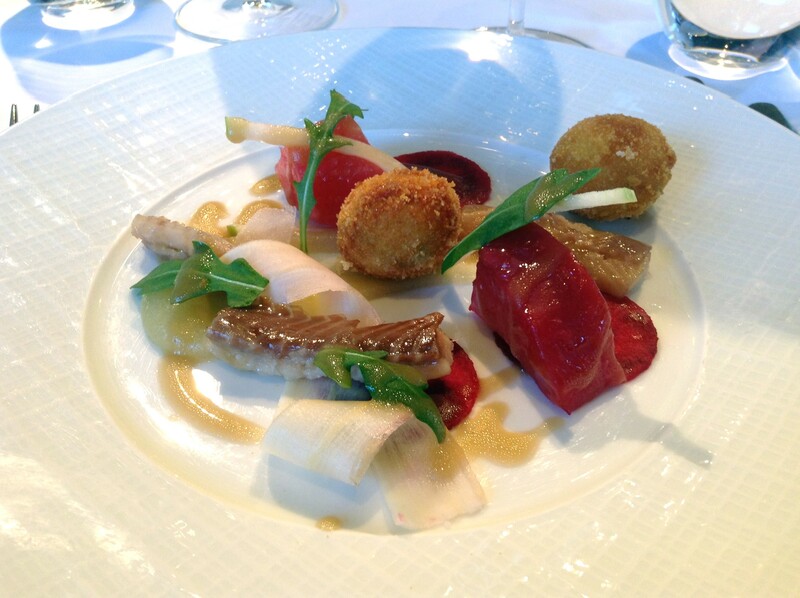 The fish and meat were both cooked to perfection and the flavors were approachable, yet sophisticated. For dessert, three of us went for the burnt vanilla cream with poached rhubarb, champagne foam and pistachio biscotti (above) which was luxury on a plate. I know some people have a thing against foam, air, snow, etc, but in this case I totally agree that its the perfect way to get another flavor into the dish without making it too complicated or heavy. 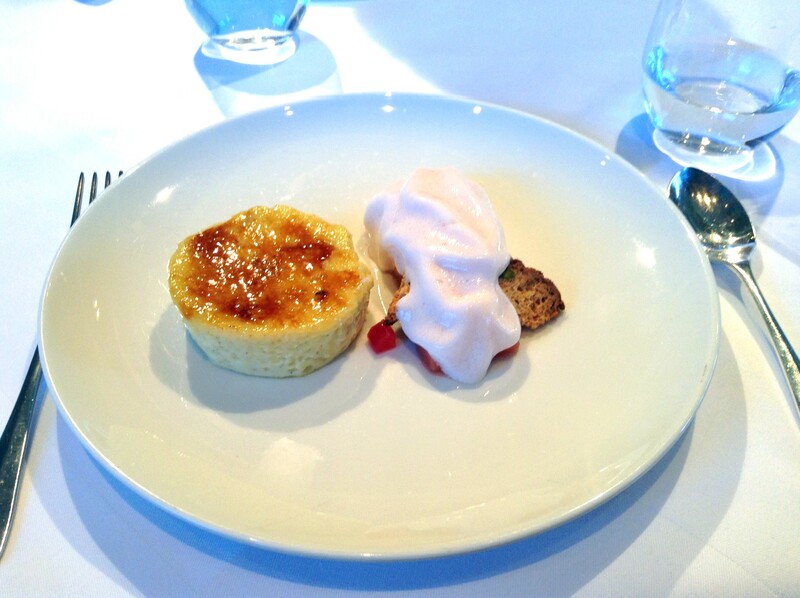 The burnt cream was very similar to a crème brûlée and the poached rhubarb was meltingly tender. Although it may not look like heaps of food, with the addition of a few pieces of bread that was to. die. for. we all left feeling pleasantly satisfied and not needing to be carted out on a dolly. And for the bargain price of £27.50 per person at lunch, I think it’s an affordable Michelin-starred experience which I would quite happily repeat.